This complex is located about 2.5 kilometers southeast of Dendera, Egypt. 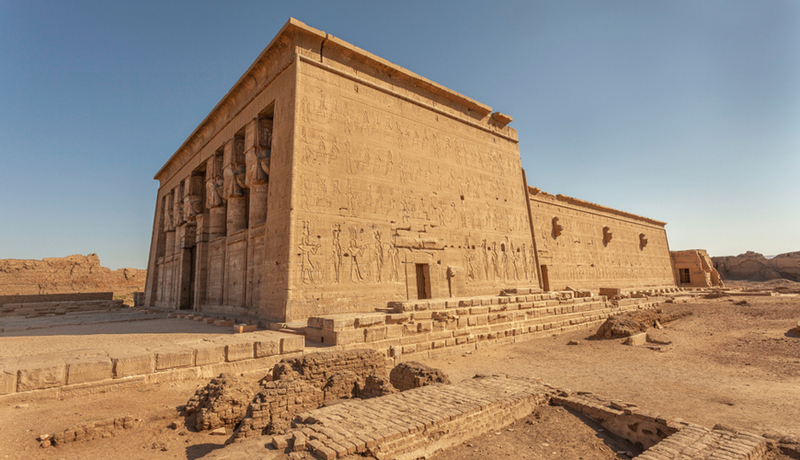 It is considered the best-preserved temple in Egypt. Dendera Temple is sited about 60 kilometers north of Luxor opposite the modern town of Qena. The complex is totally surrounded by a hefty mud brick enclosed wall and it covers around 40.000 square meters. Dendera has been the main site of ancient chapels & shrines. The pharaoh Pepi I was the one who was responsible for the establishments in Dendera. Dendera Temple was known before as the temple of Tentyra. It was mainly dedicated to Hathor. Inside the temple, there are some depictions of Cleopatra VII that symbolize the Ptolemaic Egyptian art. On the external part of the temple, there is a carving of Cleopatra VII Philopator and her son, Ptolemy XV fathered by Julius Caesar. The highest part of its roof has been closed since 2003. Hathor was the main goddess in the ancient Egyptian religion and she had many roles. She was the mother of Horus, the sky god, and Ra, the sun God. She was mainly depicted as a cow to symbolize her maternal and celestial aspects and she had the form of a woman wearing a headdress of cow horns and a sun disk. Gods such as Mut and Isis exceed Hathor but she remained one of the most widely worshipped deities. It has been the most important worship temple in ancient Egypt and it is easy to access for tourists that is why tourists love visiting such a gorgeous historical site through our Egypt tours Packages.